The death of a teenager after his first time using marijuana is a sign that state-mandated promises to mitigate impacts of legalization haven’t been kept. 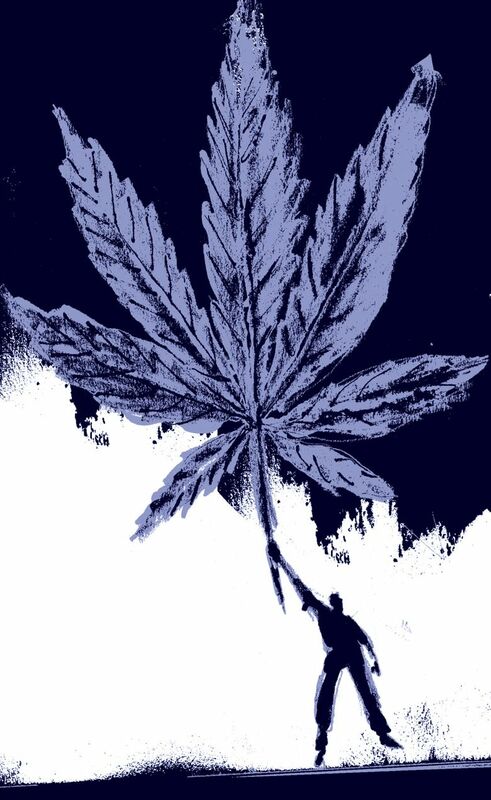 MARIJUANA legalization in Washington state has, by some measures, been an immediate success. Criminal charges for marijuana possession have all but vanished. The once-thriving black market is being daylighted. And recreational users’ wink-and-a-nod exploitation of the medical-marijuana system is gone. And legal marijuana is producing gobs of tax revenue to pay for important state services. The state budget is expected to bank an eye-popping $1.1 billion in cannabis revenue through 2018. But the experiment with legalization has other consequences. 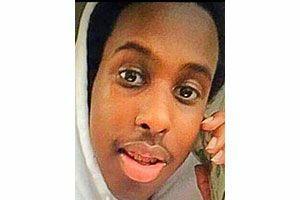 Last week, a police investigation into the death of Hamza Warsame, a smart, ambitious 16-year-old Seattle Central College student, concluded he likely jumped from a balcony in a panic after smoking pot for the first time. Warsame’s tragic death made news because of suggestions — including by Seattle City Councilmember Kshama Sawant — that he may have been the victim of an anti-Muslim hate crime. Police found no evidence of that. But his death should remind policymakers that Initiative 502 included specific promises to mitigate harmful effects of abuse — particularly among teens — with the vast revenues generated by legalization. Those promises haven’t been met. Based on the revenue coming in or forecast through 2018, the state Department of Social and Health Services should have had $113 million for programs “aimed at the prevention or reduction” of substance abuse among middle and high schoolers — kids the age of Warsame. Instead, the agency is budgeted to receive only about half that amount. Similarly, the state Department of Health should have had $77 million to operate a marijuana-education hotline and a statewide public-education campaign regarding marijuana for youths and adults. Instead, the Legislature earmarked less than one-third that amount — $24 million — and the marijuana-information hotline hasn’t materialized. A dedicated stream to pay for high-school-dropout prevention has been underfunded by half. And research at the University of Washington and Washington State University, specifically described in I-502, to study the longterm effects of marijuana use and for new methods to test impaired drivers has been even more grossly underfunded. 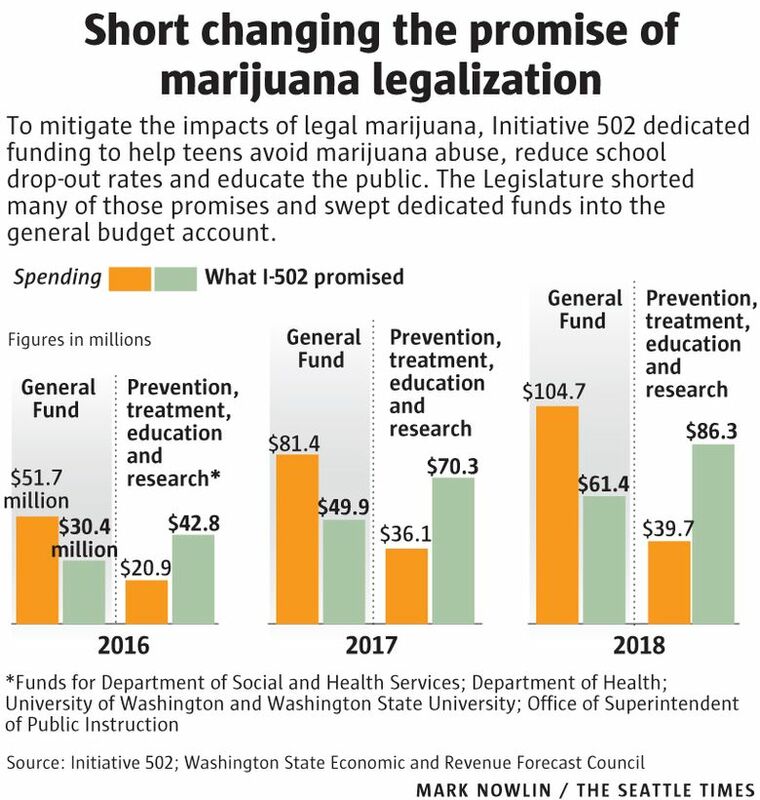 Instead, the Legislature in 2015 passed a four-year budget that would sweep almost $100 million more into the general fund than I-502 specifically dedicated — balancing the state budget with pot taxes. The Republican-led Senate actually proposed an even more aggressive grab of marijuana revenue, but backed off under political pressure from Democrats, treatment advocates and from this editorial board. The budget deal, which passed with broad bipartisan support, kept funding dedicated toward other health-care programs, but hollowed out I-502’s basic promises aimed at teen prevention and education. There is no telling if fully funded programs would have helped Warsame. But with nearly 1.1 million school children growing up in an era of legal marijuana, the state must do everything it can to provide accurate information about the consequences of marijuana use on developing brains. It hasn’t so far. Other states — including California, Nevada and Maine — this year are considering replicating Washington’s marijuana legalization experiment. They, and Washington lawmakers, should learn from what so far has been a failure to mitigate the experiment’s impact on kids.